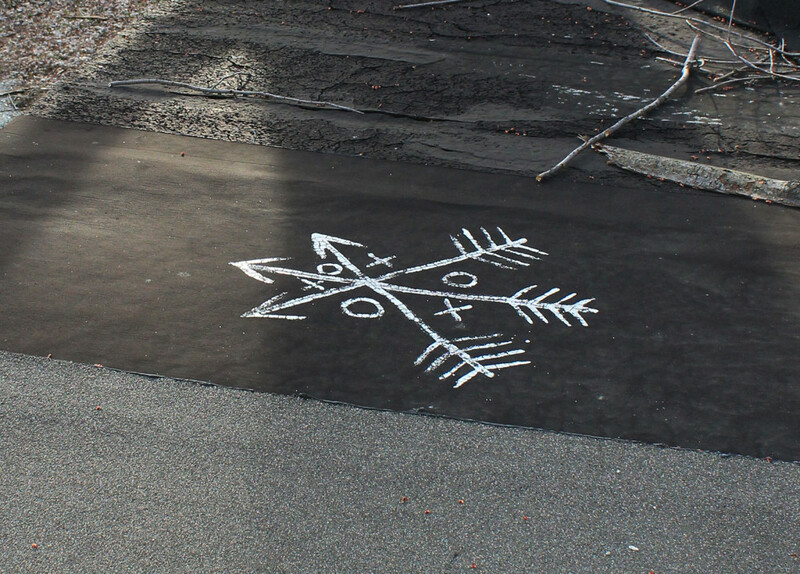 Strange symbols on the roof of the garage attached to the old schoolhouse, only visible inside the house. Were they meant to ward off evil? This is the continuation of my series of true stories which revolve around the haunted house I lived in on the east side of Indianapolis. None of these stories have been embellished in any way. In part one of this series I mentioned the human visitors that seemed drawn to my house. I wouldn’t classify all of the visitors as bad; there were pleasant visitors as well. One morning I awoke to find a puppy curled up on my front porch. Another morning I found a ferrel kitten which quickly ran away. Another evening it was an orange tabby that I named Karma. She became my faithful, loving companion while I lived there alone. Then there were the strange visitors. I guess it’s natural for home owners to be a little ashamed when the Google Streetview vehicle arrives to photograph their houses. In August 2007, my garage door was in need of painting, and I hadn’t yet replaced my roof. I’m embarrassed even today. 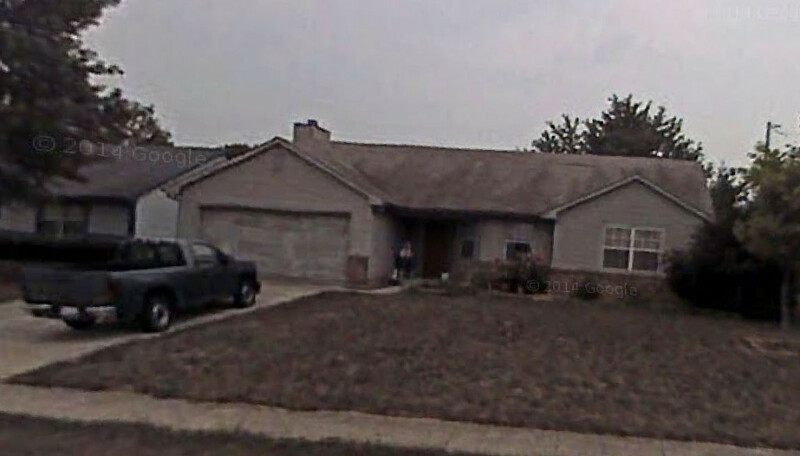 But Google captured something more intriguing than embarrassing when they took a picture of my house that day. In that image (see below) you can clearly see what looks to be a little girl dressed in school clothes standing on my porch. Typically, my front porch was clear. I did not store anything there with the exception of a white planter which you can see at the bottom right of my door. My truck was parked in the driveway, so obviously I was home. I never received visits from little girls. And yet there she is. Could it be a real person? Yes, I can’t discount that. And yet sensitive people who have walked through that house claim they have felt the presence of a little girl spirit. My step-daughter even suggested her name, Hannah Bailing (or Bailey). Strangely this last name would be recorded during an EVP session I conducted on a nearby piece of property. I will write about that later. In August 2007, Google captured the image of what appears to be a little girl standing on my front porch. When I worked full-time for Indiana University, I would often carry my laptop and a book bag back and forth between home and work. It was not unusual for me to have my hands full when I came home from work. One evening I walked to my front door, bags in tow, and prepared to dig my keys out of my pocket. I was stopped dead in my tracks by an extremely loud growl behind me and to my left. The hair on the back of my neck stood up. Judging from the volume of the sound alone, I knew it had to be really close to me. My fight or flight response kicked in, and I wheeled around ready to see what I was up against, hoping I could get in the door before whatever it was attacked me. There was no animal there. In fact, there wasn’t anything at all. I was bewildered. It sounded like it was right behind me. Now I may have had more curiosity than sense at that point, but I knew I’d heard a growl. I would have bet money there would have been a very large breed of dog right behind me judging by the sound of it. So I opened my door, set my bags inside, and took off around the house to see if it was a dog wandering by. It wasn’t the smartest thing to do, but I was befuddled. I later heard a similar growl while investigating a haunted venue known as Black Moon Manor. It was an interesting case, but again, I will have to save that story for another time. This growl was a warning, it seemed, and indeed there was an even stranger visit to come. In my first story about this house, I talked about the most scared I’ve ever been. This incident is stiff competition for the scariest thing that happened to me there. My cat, Karma, often slept on the bed with me. I learned to be aware of her presence, so I wouldn’t roll onto her, because I never knew where on the bed she would be. One December night, around 3:00 am, I felt Karma move quickly at my feet. It’s very important to my story that you realize that it was Karma which I looked at first. I will explain why in a moment. It was a very distinct and sudden movement that instantly woke me. I looked down at her there by my feet. She was staring intensely at my open bedroom door. I looked over at my door to see a dark, shadow-like figure standing there. It was clearly not human. The best way I can describe it is that it had horns or antlers similar to a deer, but not exactly like a deer. It nearly filled the full frame of the doorway, and it was hunched over with its arms or legs in a mantis like pose, almost like a deer leaping at me. I could not see it’s legs, but it seemed like it was wearing a robe. The alien creature was frozen there, as if it wasn’t allowed to enter my room uninvited, and believe me, I wasn’t about to invite it in. I do not know exactly how long I laid there looking at it. I would estimate it would have been seconds, not minutes. Finally the monstrous figure stepped backward into the hallway, and, this detail is also very important, it turned into what I can only describe as a black swirling mist which faded away. It was chilling. I lay there unable to sleep, wondering what we had just witnessed. What was that thing? It was clearly alien in nature. It hit me later that this incident had occurred around 3:00 am, same as the stereo incident. Was there a some significance to that time? Could they have happened at exactly the same time? If you’re not familiar with the term hypnopompic state, it is the state of consciousness leading out of dreams during which the human brain can superimpose visual dream elements onto what we are actually seeing in real life. I’ve had several hypnopompic dreams after being awakened during a nightmare. The effect is extremely bewildering. When this occurred, I looked at Karma first. I didn’t know what I would see. In past dreams I was already dreaming of a visual element when it was superimposed over my waking visual state. This was clearly different, in that I didn’t know what I would see when I looked over at the door. In times past, the superimposed elements faded away as I came to my senses. During my hypnopompic dreams, the dream elements did not turn into a swirling mist as they faded. The swirling mist was very distinct. During this particular incident, I did not have the same feeling of “sleep inertia” that I felt during my hypnopompic dreams. I clearly remember how I felt during those incidents. It was very, very hard to wake myself up and understand what I was seeing. This was different. I don’t think I was in REM sleep. I was almost instantly awake. If you come to a different conclusion, I certainly wouldn’t blame you, but I truly believe this wasn’t a hypnopompic dream. In the conclusion of this series, I talk more about the old schoolhouse and its demise.